This is the skirt I made this fall, and a chambray shirt from Old Navy, and some boots I just got out of my stored clothes (more on that below). 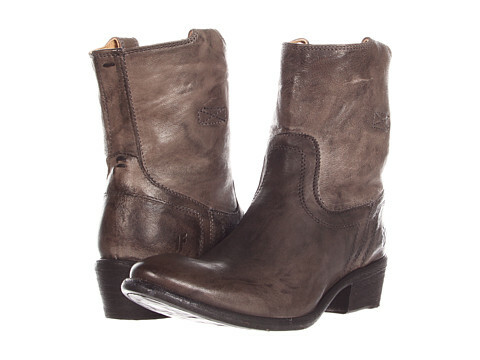 Do you remember these boots (pictured below) from my fall capsule? They're the Frye Carson Tab Short in charcoal. I preemptively added them to my fall capsule because I planned on buying them. Here's the update. Their regular price is around $350, but I found them on sale on Amazon.com for just over $200! I didn't have the money then, so I had to wait, and they dropped down to $175 - Wa-hoo! By the time I could buy them, they were around $200 again, but that was way better than $350, so I got them and felt happy about the price. The color was great and I mostly loved them, but they were too big. Wah! The price had gone up on Amazon to the full $350, and if I exchanged them, I'd only get credit for $200 towards the smaller size. Wah! again. I took a refund instead. I've been looking for a different (less expensive) pair of short black or grey boots but I haven't found the perfect ones yet. I'm still tracking the Amazon price of those charcoal Fryes to see if they drop back down again, but in the meantime I decided to start wearing the black boots that I already have. They're tall, and that's not what I envisioned for that spot in my wardrobe, but I'll adjust. These are from Kenneth Cole and I bought them in 2002, on sale. They still look good and feel good. I still really like them, so they've turned out to be an excellent, long-lasting buy. I may be getting over my disappointment about the Fryes. Can you remember a disappointing purchase that you kept thinking about for a while? What did you do? For me, sometimes when something is cheap (or a pain to return), it's tempting to keep it even though it's not quite right and try to make it work. The Frye boots were super easy to return to Amazon, and it's easier to return it when it costs more! More expensive clothes have to be close to perfect for me to buy or keep them. I'm trying to expand that mindset to EVERYTHING I bring into my home. To earn a place in my house, an item must be perfect. I need to make this my minimalist shopping mantra!